Le Mans or bust - Follow that cab! 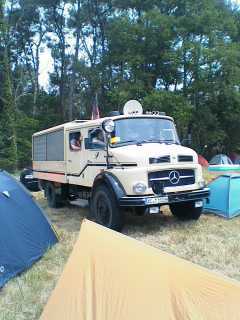 » Blog Archive » The germans know how to go camping! This entry was posted on Friday, June 16th, 2006 at 1:05 pm	and is filed under Mobile updates. I bet they still nick everyone else’s sunloungers though. Well done on getting there all of you. I hope that the German’s have a website for their trip and have returned the favour by posting a picture of you and your taxi. Have they given you any beer yet? Stick a towel on the beer keg and claim it as yours. Blimey! Their transport looks even more inappropriate for high speed intercontenal motorway journeys. I’ll bet no-one else has one though! Good luck with the journey home - you’ll need it by all accounts…..
Just think of the time they will spend at the petrol pump trying to fill that thing ! ALthough getting to watch the world cup is surely a plus ? Never really thought you’d get there! Why does Phil always have a can of beer in his hand ? Is the report on the Houx Annexe challenge coming soon? Thanks for the nice head line! I just had to find out the meaning of “bust” so I visited your website… It was a pleasure for us to view your nice cab all the time! Next time you should come over and ask for some beer and watch the games… Then I will ask for a taxi drive to park bleu! We meet always twice in lifetime - keep your eyes open, you´re welcome!